Game on. Microsoft holds a virtual monopoly on office productivity software, but Google is virtually synonymous with the Web. Google has tried to challenge Microsoft with Google Docs--the productivity component of its Google Apps suite--and now Microsoft is taking the battle onto Google's turf with the cloud-based Office 365. It's go time, as Microsoft released its suite Tuesday. The actual features and functionality of the tools have a lot of bearing on which productivity suite you choose. The Word Web App is more visually appealing and polished than its Google counterpart, but overall the two seem roughly equivalent in features. I created a sample presentation in both the PowerPoint Web App and Google Docs Presentation. 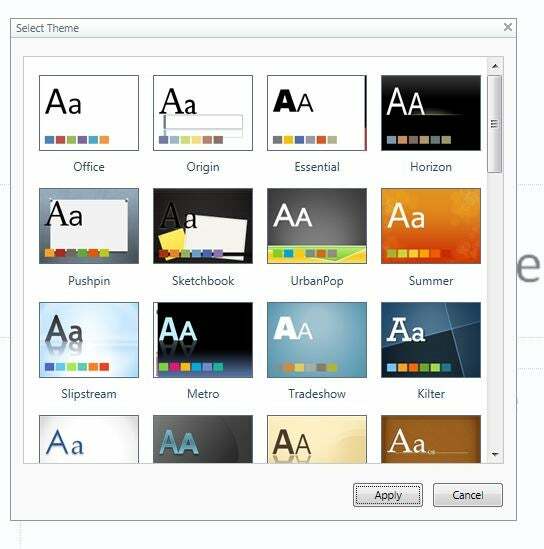 The first--PowerPoint Web App--immediately presented me with a diverse selection of attractive themes to choose from. Google defaulted to plain black text on a plain white background. I clicked Format, Presentation Settings, Change Theme, but the options available were not as impressive. As I added slides and created content, I inserted an image. In Google Presentations, the image filled the whole slide and I had to manually adjust it to fit the available area, but the PowerPoint Web App was smart enough to size the image automatically. When push comes to shove, the features of the Office Web Apps in Office 365 are pretty much the same as what Google Docs has to offer. However, Microsoft makes key features easier to get to, and works more intuitively. For users already familiar with Microsoft Office, the Office Web Apps version will be a comfortable fit. Both Office 365 and Google Docs are Web-based platforms, and they will work from any Web browser--more or less. It should not come as any surprise that Google Docs excels in the Chrome browser while Microsoft Office 365 works best in Internet Explorer. It makes sense that each would make sure--first and foremost--that their online productivity tools are optimized for performance and functionality in their own browser. I opened both Office 365 and Google Docs in Internet Explorer, Firefox, and Chrome for comparison. In Internet Explorer, Office 365 works fine. Google Docs seems to work for my purposes, but there is a nagging yellow warning bar across the top letting me know that Internet Explorer does not support all features of Google Docs. In Chrome, both productivity platforms work as expected, but Firefox is another story. I didn't have any problem logging in and using Office Web Apps in Office 365, but I was unable to log in to Google Docs from Firefox 5. I got redirected to an error page claiming something about my browser not accepting cookies--annoying, but not a deal breaker. After I went into the Firefox options and cleared the history and cache, though, I was able to connect with Google Docs in Firefox 5. Given that Office Web Apps and Office 365 work in all three browsers, while Google Docs claims it is only partly functional in Internet Explorer, the edge here goes to Microsoft. This area is a slam dunk for Microsoft. Sorry, Google. It's a Microsoft Office world. Even if you use an alternative office productivity suite like Google Docs or LibreOffice, the vast majority of the world uses Microsoft Office. The usefulness and value of your alternative suite is measured by how well it works with Microsoft Office. If files that are sent back and forth between partners, peers, and customers end up with formatting issues, it creates frustration and requires unnecessary effort to fix. I took the same .docx Word file from my local computer and uploaded it to both Google Docs and the Word Web App. The file opened fine in both tools. I made some formatting changes--some bold text, some italic text, some highlighted text--and inserted an image; I then saved it and downloaded it back to my PC. When I opened it in Word 2010 again, the Word Web App file looked exactly as it should, but the Google Docs file had a different font, different line spacing, and jacked formatting. It doesn't hurt, either, that with the Word Web App I can just click a button on the ribbon bar to open the file in Word rather than having to download it. Collaboration in real time is the primary selling point of Google Docs, and is the main area where Google should easily outshine Microsoft. Google Docs can be shared with any other Google account. The users who share a file can all access and work with it simultaneously. Each user is assigned a unique color so you can easily identify who is making changes to what. You can also open a bar on the right side of the screen to chat with your collaborators. Microsoft lets you share files with anyone, and also offers real-time collaboration and chat capability with coauthors. With Google Chat, you can see who else is viewing a file and chat with them while collaborating. Google has Google Chat and Google Voice features built into Gmail, so users can instant-message or do audio/video calls with their contacts. It is in these features, though, where Office 365--with the Lync 2010 client--beats Google. The integrated instant messaging, audio/video conferencing, and Web-session whiteboarding features, combined with real-time presence information, give Microsoft a slight edge. The net result is that Microsoft offers more and better real-time collaboration than Google. Click the chart for a comparison of features in Office 365 and Google Apps. Office 365 starts at $6 per user per month for the Professional and Small Business plan. The Medium Business and Enterprise plans range from $10 to $27 per user per month. No matter how you slice it, those numbers add up to a lot more than free--which is the price for Google Docs. But, to keep things apples to apples, it is more fair to pit Office 365 against a paid Google Apps for Business account, which runs $50 per user per year. Still, the $72 per year per person is a significant cost savings over the equivalent cost of purchasing and maintaining the server and software infrastructure it would require to deliver the tools and services in Office 365--never mind the cost of the salary for the IT admin to run it all. But for individuals or smaller organizations, those numbers still add up quickly when compared with zero. With the paid subscriptions, both Google and Microsoft put their money where their proverbial mouths are and financially back a guaranteed uptime service level agreement (SLA).. While Microsoft and Google are each trying to encroach on the other's turf in a battle for supremacy in Web-based office productivity, it will be office productivity that trumps the Web-based part of the equation. Ultimately, the winner of the smackdown will depend on subjective factors that will vary from one individual or organization to the next. With the possible exception of cost, it seems that Microsoft has an edge in almost every category of comparison, but both Microsoft Office 365 and Google Docs have their pros and cons. Weigh the benefits of each, and carefully consider which online productivity platform is the right one for you.